~David Beckham~ and his equally famous wife ~Victoria Beckham~ were spotted by a spy at French Blue in St. Helena last month. 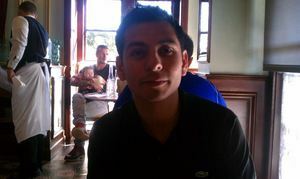 The trio were also spotted at Oenotri in Napa, according to the Napa Valley Register (hat tip to Eater). Last week, Michael Murphy tweeted that ~David Beckham~ and ~Victoria Beckham~ had lunch (avec children) at Bistro Don Giovanni in Napa—he also told me they had lunch the previous day at Bouchon Bistro.